I found myself in need of a baby shower gift this week. I looked at the gift registry, but knew I had little time for shopping. I chose one item from the registry — baby bibs — and decided I could whip up a few at home. Very quick to make and I didn’t need to run to the store to buy any supplies. The internet has many free patterns to choose from; I went to Chickpea Studio after reading a couple reviews. Opening my scrap drawer, I found two t-shirts (solid blues), a flannel remnant (the adorable farm scene), and two cotton prints that would disguise spit-up very well. Using scraps was also a way for me to experiment — I think I need that ever-missing walking foot to gain success with t-shirt material and the twin needles. Because I used t-shirts, I’m linking up to Jill’s place. 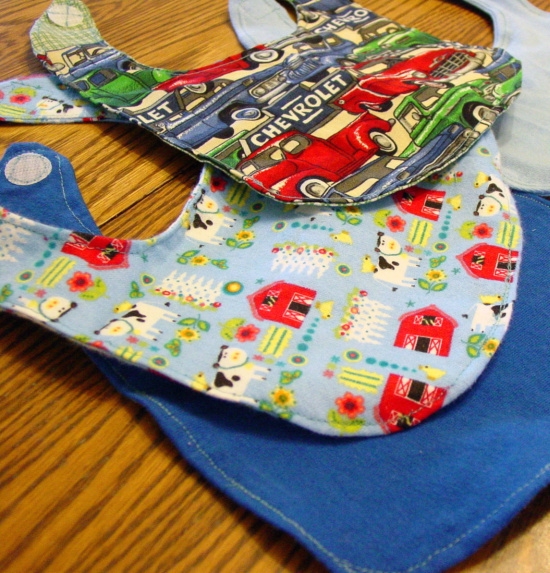 The fabric makes a great weight and absorbency for baby bibs. Find more upcycling ideas over there and be inspired. Heather, who wrote: “I would make myself a ton of skirts for the summer.” Heather, you’ll get an email from me soon. Thank you for entering and I hope you come back soon. My next giveaway will be for a Large Single Topping Pizza from Casey’s.